If you want to have fresher and younger-looking skin, try Botox ®. Battle Creek residents use this facial rejuvenation treatment to remove their frown lines and smooth their wrinkles. With help from Botox®, Battle Creek men and women can reverse the visible effects of aging and start radiating confidence. Say goodbye to crow’s feet lines and hello to a more youthful and radiant face through Botox® in Battle Creek. At Restorative Health Care, we offer a variety of noninvasive and minimally invasive cosmetic treatments, including Botox®. Battle Creek patients depend on us to eliminate their unwanted fine lines and wrinkles. Through cosmetic treatments like Botox® in Battle Creek, we help many people look and feel beautiful. 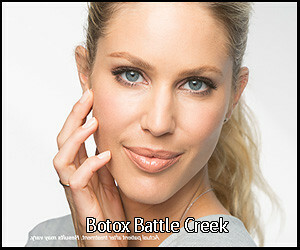 What Is Botox® in Battle Creek? Botox® is a noninvasive, FDA-approved treatment that improves the appearance of moderate to severe frown lines and crow’s feet. Used by adults aged 18 to 35, Botox® in Battle Creek is a great way to diminish the appearance of lines and wrinkles associated with aging. If you’re serious about improving the appearance of moderate to severe frown lines, Botox® in Battle Creek may be the right option for you. Unlike facelifts or other invasive facial rejuvenation procedures, Botox® in Battle Creek takes minutes and requires zero downtime. As soon as the procedure is done, you’ll be out of the door, feeling refreshed and confident in no time! How Does Botox® in Battle Creek Work? Wrinkles appear in one’s face because of the muscles above and between the eyebrows that continually contract and tighten. Botox® in Battle Creek combats this by working beneath the skin’s surface and targeting the underlying muscle activity that forms wrinkles and frown lines. Through Botox®, Battle Creek patients will notice a visible smoothing of the crow’s feet and frown lines between their brows. What Are the Benefits of Botox® for Battle Creek Patients? If you want beautiful and youthful skin without going under the knife, Botox® in Battle Creek can be the ideal solution. Through this minimally invasive procedure, you can reduce wrinkles and frown lines without the need for surgical enhancement. With Botox®, Battle Creek men and women can enjoy a fresher and more radiant appearance. Are you looking for a facial rejuvenation procedure that can provide quick results? Try Botox®. Battle Creek patients who undergo this treatment can generally see a marked improvement in their frown lines within days. The entire procedure takes approximately 10 minutes, and most patients are in and out of the physician’s office without any downtime. Lines may also continue improving for up to 30 days. Bear in mind that individual results may vary for people who try Botox® in Battle Creek. Since Botox® in Battle Creek is a minimally invasive procedure, you won’t have to worry about feeling pain. Before your injection, the physician may choose to numb the area with a cold pack or anesthetic cream. While undergoing Botox®, Battle Creek patients will usually experience minimal and brief discomfort. If you’re interested in undergoing Botox®, reach out to Restorative Health Care. We are dedicated to providing cosmetic procedures that help patients enhance their appearance and improve their confidence. Before going through with any procedure, consult our professional team. Contact us, and schedule an appointment for Botox® in Battle Creek today! Click here to learn more about our Botox treatment. Whether you need help with weight management or eliminating unsightly varicose veins, our professional team is here to provide the solution to your problems. With our guidance, you can better manage your nutrition, battle chronic illnesses, and even regain confidence in your appearance.